Under my conditions the following species flower during May and/or June. All except one, denoted by an asterisk, are grown without heat. Dendrochilum macranthum* is grown in my heated glasshouse at a minimum temperature of 12°C. The Mexican species Arpophyllum spicatum has long, rigid, strap-like leaves on slender cylindrical pseudo-bulbs. It is a tough plant, well suited to withstand the fierce winds of its mountainous habitat. The terminal inflorescence bears dozens of small, crowded rose-pink flowers, each held with its lip uppermost. 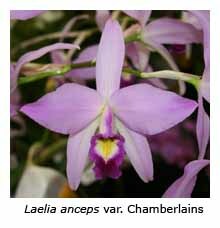 It prefers a bright position in the shade-house, where it flowers in June. Plants grown with heat flower several months earlier. Dendrochilum macranthum* was incorrectly known in Victoria as Dendrochilum magnum for many years. A native of the Philippines, it has the largest plant and inflorescence of any dendrochilum that I know. The pendulous inflorescences, reaching a length of 500 mm or more, carry dozens of straw-coloured flowers that turn orange as they age. 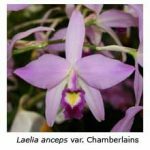 Laelia anceps and its close relative Laelia gouldiana are hardy Mexican species that can withstand a great deal of neglect, and I recommend them to all new growers, once they have mastered the art of growing and flowering cymbidiums. Up to five large pink flowers are produced on a long, arching inflorescence in late autumn or early winter. Both enjoy regular watering and fertilising when in active growth but need little water during winter and early spring. Oncidium enderianum and O. forbesii are both suitable for shade-house cultivation in Melbourne, where they flower in autumn. Oncidium enderianum is the most widespread of those species in section Crispa, being found in a number of Brazilian mountain habitats, including the Organ Mountains (at about 1000 m altitude) near Rio de Janeiro. Its pseudo-bulbs are said to grow to 75 mm tall, and its twin leaves to 300 mm, although those of my plants don’t quite reach these limits. Its inflorescence reaches to 300-450 mm and carries up to 16 chestnut brown blooms with yellow markings, each about 40 mm across. These oncidiums should be watered only when they are in active growth, that is, when their roots have active tips. After the plants finish flowering in late autumn, the tips of their roots seal over with a white layer of velamen, and they should not be watered then until new green root tips appear again in spring. Once new growth begins, the plants should be watered and fertilised regularly, which helps to build up the big pseudo-bulbs needed for good flower production. The flower spikes usually emerge from the developing new growths in early summer but they mature very slowly, over a period of several months, before the flowers open, usually in late autumn. Pleurothallis truncata enjoys conditions that also suit masdevallias. 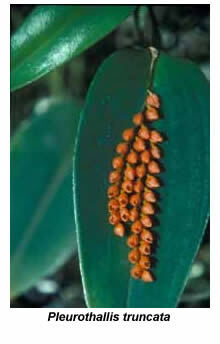 As the case with most pleurothallis, the inflorescences emerge at the junction of the stem and its leaf. 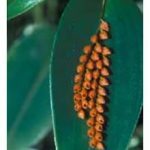 In this species there are usually two inflorescences per leaf, each bearing a dozen or so small, bright orange flowers that resemble miniature tulips. 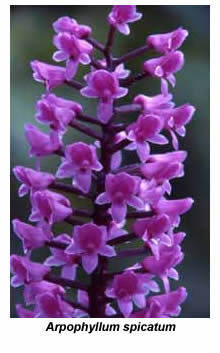 The South African terrestrial orchid Stenoglottis longifolia usually flowers in May. It grows well in most good garden composts. 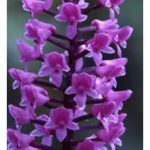 In well-grown plants the flower stem may reach 600 mm tall and carry fifty or more small, pink flowers, although only about twenty open at any one time. Divide and re-pot the fleshy tubers every few years when the plants are dormant.